Consumers are spending more and more and putting it on plastic. That's not so bad if they pay it off each month, but a new report says they aren't. The personal finance site WalletHub.com has issued a report, showing consumers put a record $60.4 billion on their credit cards in the fourth quarter of 2016. The authors of the report say that's "a serious cause for concern." Here's why: it's the largest increase in fourth quarter credit card debt since 2007, which is when The Great Recession began. It's the third-largest total in the last 30 years. But what's worse, it ballooned credit card balances. The spending increased net credit card debt in 2016 by $89.2 billion, the largest annual increase -- again -- since 2007. The report paints the picture of a troubling trend. 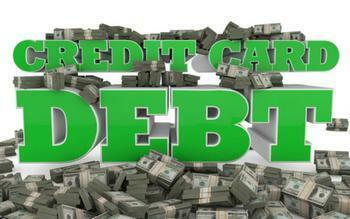 Consumers added $21.9 billion in new credit card debt during the third quarter last year. That came on the heels of a record second quarter increase in debt of $34.4 billion. Meanwhile, the first quarter of last year saw the smallest pay-down of credit card debt since 2008. "So it is not a question of whether consumers are weakening financially, but rather how long this trend toward pre-recession habits will last and just how bad it will get," the authors write. "And WalletHub projects that in 2017 we will surpass the current record for outstanding balances by at least $100 billion." Consumers who find themselves with growing credit card debt can take steps to reduce it. One of the most efficient steps is to transfer some or all of your high interest balances to a new credit card that provides an introductory period of 0% interest. That means 100% of your payment each month goes to pay down the balance. If you have a large balance, one of the best cards for a transfer is the Chase Slate. It provides 15 months of interest-free payments and does not charge a balance transfer fee if you make the transfer within 60 days of activating the account. If you are unable to transfer your balance to an interest-free card, make sure your payments each month are enough to make a real difference. Don't pay just the required minimum -- pay more. Look at your bill and determine the monthly finance charge. Pay that amount, plus as much as you can afford to pay against the balance.